U.S. Bureau of Census released the 2010 Census final mail participation rates for geographic areas down to tract level. 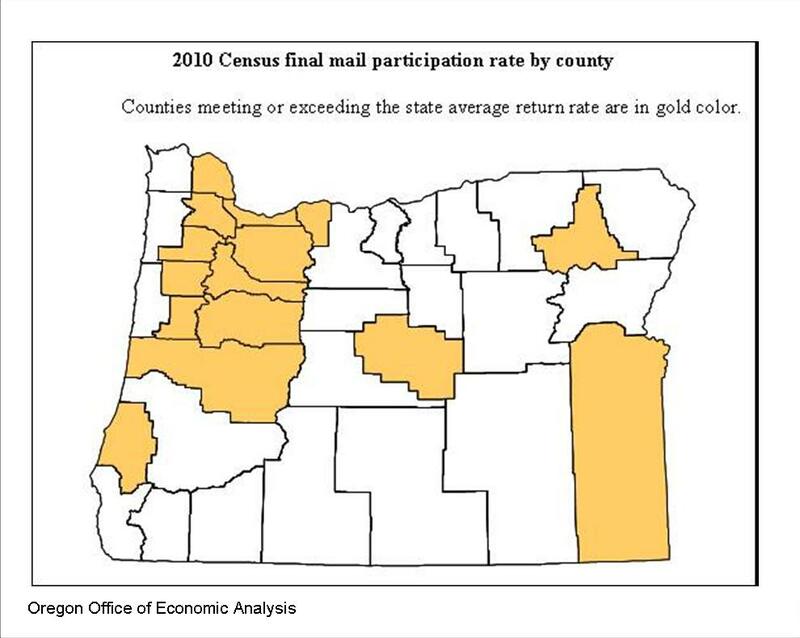 Oregon’s 2010 Census final mail participation rate was 76 percent. Although this rate is better than national average of 74%, it fell short by about one percentage point of meeting the 2000 Census participation rate. National average for 2010 Census participation rate matched 2000 Census rate of 74 percent. 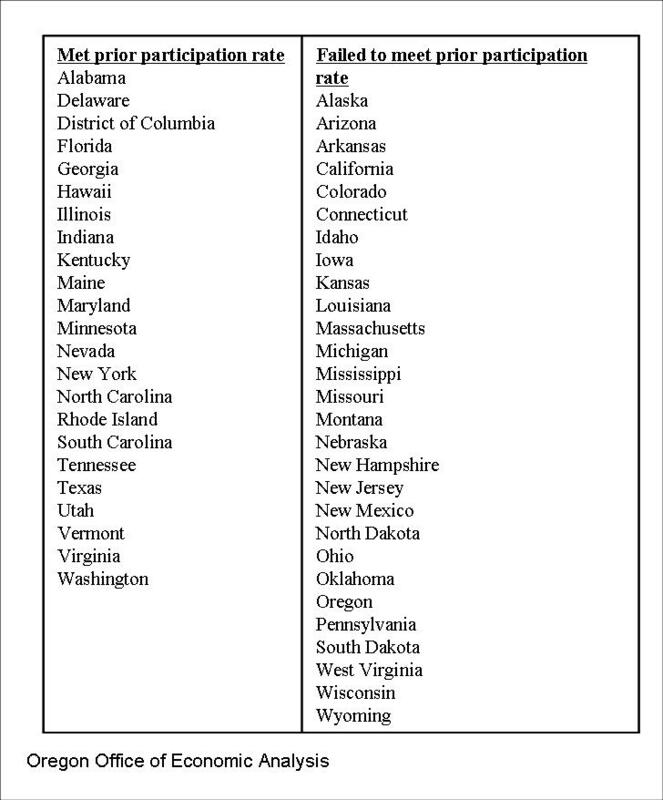 Only 22 states, shown in the following table, and District of Columbia met or exceeded the 2000 rates. The Census Bureau launched a multimillion dollar advertising campaign encouraging the residents to return their census forms. Other government and non-government organizations of varying hierarchy also played an important role in the Bureau’s outreach effort to maximize the census forms mail-back rate. Individuals help save millions dollars in taxpayer’s money just by returning the census forms. The Bureau estimates that for each percentage point improvement in participation rate, the Census cost would decline by $84 million. Beginning in May 1st, the census takers visit the housing units that did not return the census form. Such in-person visitation is a lot more expensive that mail-out and mail-back operation. States with the highest mail participation rates include: Wisconsin (82%), Minnesota (81%), Iowa (79%) and Indiana (79%); and the states with the least participation rates are: Alaska (64%), West Virginia (65%), New Mexico (65%), and Louisiana (65%). The states with greatest improvement in participation rates are North and South Carolinas (7%), Kentucky (5%), and Tennessee and Alabama (4%). Most of the counties meeting or exceeding the state average census mail participation rate in Oregon are along the upper I-5 corridor or Willamette Valley region. Outreach and access to information may have influenced the higher return rates in this area. Benton, Columbia, Polk, and Washington counties led the way with return rates of 79% or higher. 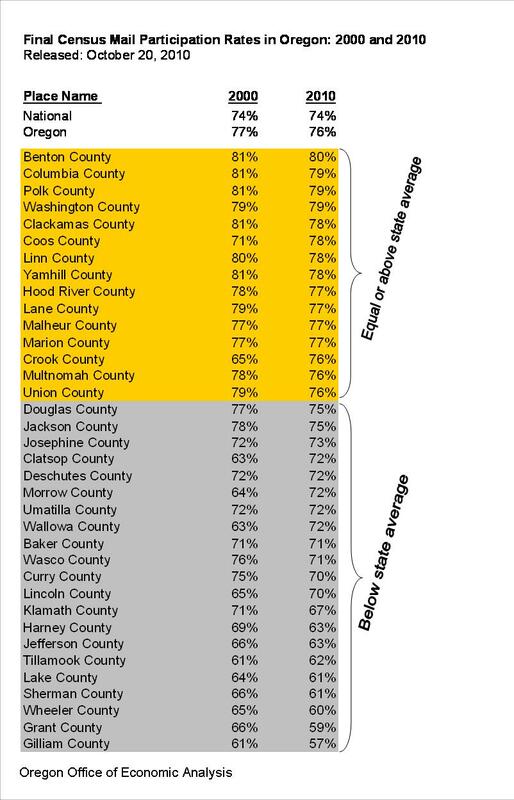 Crook, Clatsop, Wallowa, Morrow, Coos, and Lincoln counties improved the return rates by five percentage points or more in 2010 over the 2000 rates. Grant, Harney, Wheeler, Sherman, Curry, and Wasco counties led the way down in worse than 2000 return rates. It appears that big swings in participation rates are associated with smaller counties. 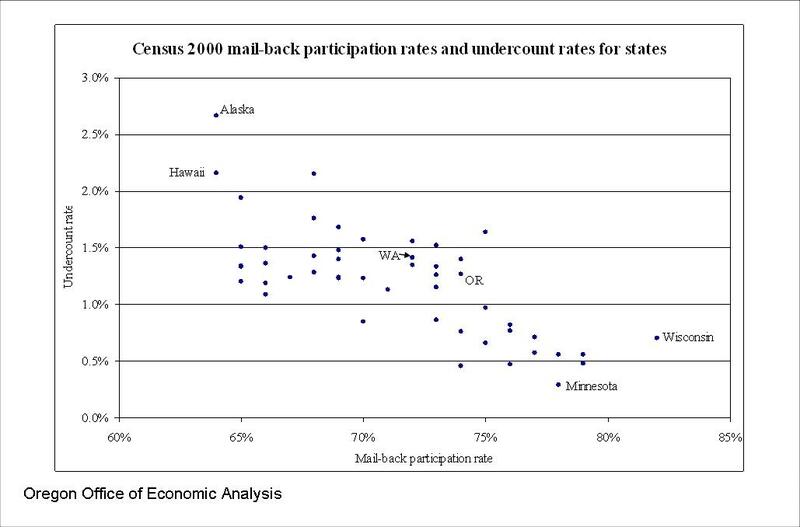 Census mail-back participation rate and census undercount rate appear to be negatively correlated. In 2000 Census, states with high participation rate like Wisconsin, Iowa, Nebraska, and Minnesota all had low undercount rate. Alaska, Hawaii, New Mexico, Delaware etc. had low participation rate and high undercount rate. Goal of the census campaign and outreach program is to minimize the undercount by maximizing the participation. In Census 2000, national undercount rate was estimated at 1.18 percent and Oregon’s was 1.27 percent. This means nearly 44,000 people in Oregon were missed by the Census 2000. Although Oregon’s undercount rate of 1.27 in 2000 was higher than the national average, it was a substantial improvement from 1.9 percent undercount in 1990 census. Lowering the undercount rate is important for at least three very important reasons: political, financial, and policy decisions. Political: the census count is used to reapportion the U.S. House of Representatives. The number of Representatives from each state is based on the population of the state. A significant reduction from the 2000 census undercount rate with favorable population growth rate will give Oregon an additional congressional seat. Other competing states for the 435th member of the House of Representatives are Ohio, Florida, Missouri, Minnesota, Texas, Washington, and South Carolina – competing either to add a seat or to hang on to the seat they already have. Also, census data determines state and local legislative and congressional districts. Financial: the census count determines the distribution of more than $400 million annually in federal funds. Higher undercount means the state will lose its fair share of the federal dollar. The amount that is supposed to go to a state with higher undercount rate will go to the states with lower undercount instead. Therefore states are competing to lower the undercount rate by encouraging higher participation in the current census. It is important to remember that the loss of federal dollar due to higher undercount will carry over for ten years until the next census results are incorporated in the distribution formula. The amount allocated to each state for each additional person depends upon relative undercount rate of that state. As estimated by PriceWaterhouseCoopers for the U.S. Census Monitoring Board based on eight largest federal grant programs, the Census 2000 undercount resulted in a loss of $33.6 million dollars by Oregon over the ten year period. The actual loss is probably higher because the study doesn’t include all the federal funding tied to population count. Policy decisions: the census data is used by policy makers and planners to determine the budget allocation, and need assessment and location determination for schools, housing, child-care and senior centers, shopping centers, businesses, roads and more. Accurate population data is vital for determining the type and level of services to be provided to the local communities. We can only hope for a low undercount rate for Oregon. Possibly we will gain another congressional seat and we get larger share of the federal funding pie. I don’t understand how undercount can be measured so precisely. If we know enough to determine how many people were not counted, then why did we have to count in the first place?